If you are learning how to can carrots, start by learning a little about the different varieties. Although you can get by canning almost all carrots, some are better than others. Some varieties are very large and more fibrous than the actual canning ones. These very large carrots need to be cut into small pieces when canning. The smaller varieties of carrots are really delicious when canned whole. 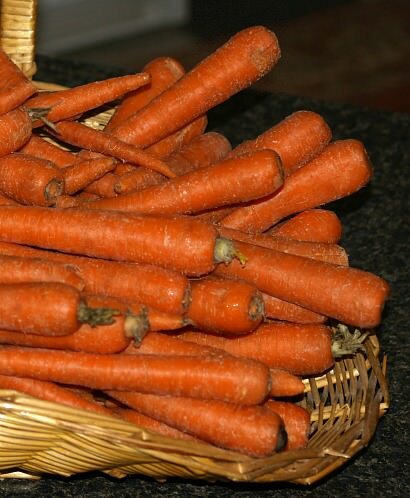 If you grow your own carrots or want ones specifically for canning, following is a list of some types; Canden, Danvers, Gold Pak, Nantes Express, Nantes Half Long, Processor II, Redca, Royal Chantenay, Suko, Country Gentleman, Early Extra Sweet, Golden Beauty, Golden Cross Bantam, Kandy Korn E.H.. When learning how to can carrots, unlike tomatoes or fruits, carrots need to be canned in a pressure cooker. Carrots, as well as other vegetables and meats are low acid. All these low acid foods need to be canned under pressure for safe eating. 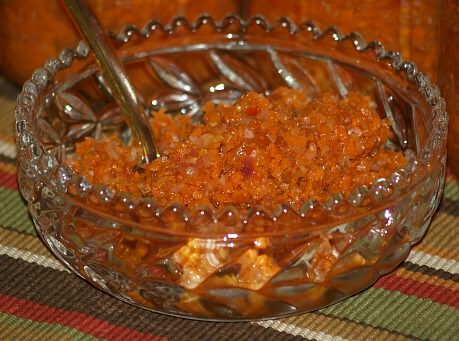 The exception to this rule is carrots canned with vinegar or other high acid ingredients. These would include carrot pickles, relishes and jams. You can learn how to can carrots by the “raw pack” method or “hot pack” method. Whichever way you choose, start by thoroughly cleaning and scraping young tender carrots. You can use small carrots left whole, cut larger ones in chunks, slice or dice them. After preparing the carrots, for RAW PACKING fill clean hot sterilized canning jars tightly LEAVING 1 inch headspace. For HOT PACKING place prepared carrots in a large stock pot. Cover them with boiling water and return water to a boil. Pack carrots into clean sterilized hot jars LEAVING ½ inch headspace. After filling the jars with the carrots, whichever method you choose, the rest is the same for both methods. Add ½ teaspoon of salt to each pint jar OR 1 teaspoon of salt to each quart jar. Fill the jars with boiling water leaving ½ inch headspace. Place jars in your pressure canner with 2 or 3 inches of hot water (WHATEVER AMOUNT THE MANUFACTURER RECCOMMENDS FOR YOUR CANNNER). Process the carrots under 10 pounds of pressure for 25 minutes (for pints) and 30 minutes (for quarts). If you are learning how to can carrots, know what altitude you are at. It is important to adjust the pressure on your canner and the length of time to fit your altitude. UNLESS YOUR RECIPE SPECIFICALLY RECOMMENDS PRESSURE AND TIME, when canning carrots at altitudes under 2000 ft, process at 10 to 15 pounds of pressure. When processing at altitudes above 2000 feet raise the pressure to 15 pounds ONLY. 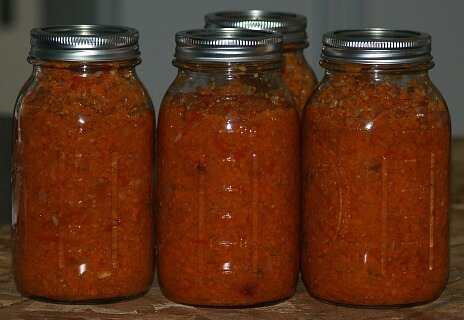 Can carrots either in pint or quart canning jars; no half gallons or larger. For both pint and quart jars use the same processing time. For altitudes under 3000 feet, process for 15 minutes; for altitudes 3000 to 7000 feet, process for 30 minutes; for altitudes over 7000 feet, process for 45 minutes. Combine 3 cups of vinegar, honey, celery seed, mustard seed and salt in a large pot; bring to a boil and boil for 10 minutes. Coarsely grind onions, carrots, peppers and cabbage; add to boiling vinegar honey mixture. Reduce heat and simmer 15 minutes; add remaining 1 cup of vinegar. Increase heat and bring to a boil; boil over medium heat for 5 minutes. Pour mixture into hot sterilized jars; adjust lids on jars. Cook carrots just until tender crisp; drain. Combine sugar, water, vinegar and salt in a saucepan. Tie spices in a cheesecloth bag and add to vinegar mixture. Bring mixture to a boil; boil about 7 minutes. 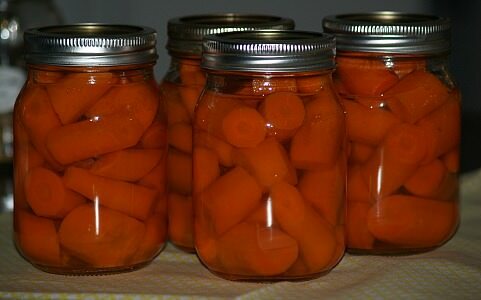 Pack carrots in hot sterilized canning jars leaving about ½ inch headspace. Pour boiling hot vinegar mixture over the carrots leaving ½ inch headspace. Adjust jar lids; process in hot water bath for 30 minutes for pints and quarts. Place all vegetables (EXCEPT hot pepper) in a large crock or large container (NO METAL CONTAINER). Dissolve salt in water; pour over vegetables and let stand 12 to 18 hours in cool place. Place vegetables in colanders; let drain thoroughly. Combine spices, hot pepper, sugar and vinegar in a large stock pot; bring to a boil and boil 3 minutes. Add drained vegetables to stock pot; simmer until thoroughly heated (DO NOT BOIL). Pack hot vegetables into hot sterilized jars leaving about 1/8 inch headspace. Adjust hot lids and tighten to seal; makes 6 pints. 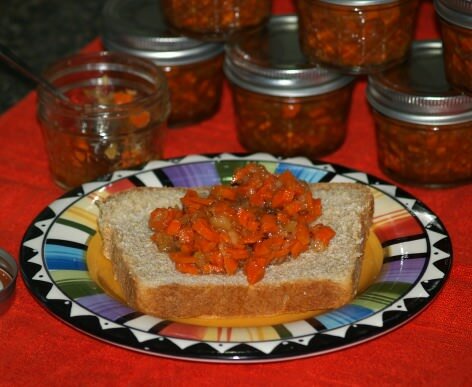 Keep this recipe in mind to give as gifts when you learn how to can carrots. Squeeze lemons juice into a large saucepan (REMOVE ALL SEEDS). Slice the lemon rinds and GRIND; add ground rind, sugar, cinnamon and cloves to saucepan. Heat mixture SLOWLY while stirring frequently until mixture thickens. Pour into hot sterilized jars; wipe rims and adjust lids to jars. Process in boiling water bath for 5 minutes. Makes 4 ½ pints. Combine sugar, vinegar, water and salt in a medium saucepan; bring to a slow boil. Add carrots and ginger to the saucepan; cover and simmer until tender crisp (About 4 minutes). 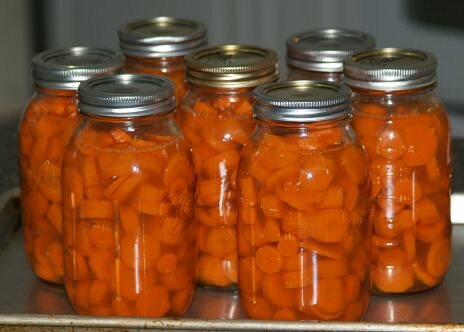 Spoon carrots into hot sterilized jars; adjust hot lids and tighten. Process in hot water bath for 30 minutes.